Background and objectives Infantile nephropathic cystinosis is a severe disease that occurs due to mutations in the cystinosis gene, and it is characterized by progressive dysfunction of multiple organs; >100 cystinosis gene mutations have been identified in multiple populations. Our study aimed to identify the clinical characteristics and spectrum of cystinosis gene mutations in Turkish pediatric patients with cystinosis. Design, setting, participants, & measurements We identified the clinical characteristics and spectrum of cystinosis gene mutations in Turkish patients with cystinosis in a multicenter registry that was established for data collection. The data were extracted from this registry and analyzed. Results In total, 136 patients (75 men and 61 women) were enrolled in the study. The most common clinical findings were growth retardation, polyuria, and loss of appetite. None of the patients had the 57-kb deletion, but seven novel mutations were identified. The most common mutations identified were c.681G>A (p.Glu227Glu; 31%), c.1015G>A (p.Gly339Arg; 22%), and c.18_21 del (p.Thr7Phefs*7; 14%). These mutations were associated with earlier age of disease onset than the other mutations. To understand the effects of these allelic variants on clinical progression, the mutations were categorized into two major groups (missense versus deletion/duplication/splice site). Although patients with missense mutations had a better eGFR at the last follow-up visit, the difference was not significant. Patients in whom treatment began at age <2 years old had later onset of ESRD (P=0.02). Time to ESRD did not differ between the patients with group 1 and group 2 mutations. Conclusions The most common cystinosis gene mutations identified in Turkey were c.681G>A (p.Glu227Glu), c.1015G>A (p.Gly339Arg), and c.18_21 del (p.Thr7Phefs*7). Patients with less severe cystinosis gene mutations tend to have better kidney outcome. Nephropathic cystinosis is an autosomal recessive metabolic disease in the family of lysosomal storage disorders. Worldwide, its incidence is 0.5–1/100,000 (1). After identification of the cystinosis gene (CTNS), >100 CTNS mutations have been described, most of which lead to the complete loss of function of the cystinosin protein. Cystinosin is a 367-amino acid peptide that is sorted via a classic tyrosine-based GYDQL lysosomal sorting motif in its C-terminal tail (2). Recent studies reported that altered vesicle trafficking and impaired mammalian target of rapamycin signaling are pathophysiologic mechanisms in addition to cystine accumulation. Cystinosin is required for transport of free cystine from lysosomes to cytoplasm. Under cystinosin-deficient conditions, free cystine accumulates in lysosomes and forms toxic crystals, leading to tissue and organ damage. All organs are affected by cystinosin deficiency; however, kidney impairment in particular is prognostically relevant. The most frequent CTNS mutation, which affects approximately 76% of Northern European alleles, is a large 57-kb deletion involving the first nine exons and part of exon 10 (1,3); however, Topaloglu et al. (4) showed that none of the Turkish patients in their study had the 57-kb deletion and concluded that occurrence of the deletion was limited in the Eastern Mediterranean and Middle East. As such, evaluation of multiple large-scale patient series is important for improving our understanding of the genetic basis of cystinosis. Patients with cystinosis have a normal phenotype at birth and then develop growth retardation, metabolic acidosis, dehydration, and other symptoms related to Fanconi syndrome in infancy. In patients with cystinosis receiving cysteamine treatment, kidney damage dominates the clinical picture and leads to kidney failure, most commonly during the second to third decades of life. Although systemic cysteamine treatment delays the development of CKD, it is insufficient for preventing ESRD (5). This study aimed to identify the clinical characteristics and spectrum of CTNS mutations in Turkish patients with cystinosis and determine the effect of genetic characteristics on clinical outcome. Cystinosis was diagnosed on the basis of observation of corneal cystine crystals via eye examination and/or an elevated leukocyte cystine level (>2 nmol half-cystine per mg protein) and/or CTNS gene mutation(s). Fanconi syndrome was diagnosed in patients with cystinosis on the basis of standard clinical and biologic criteria, including growth retardation, polyuria-polydipsia, electrolyte imbalance, dehydration, and/or rickets (5). Hypothyroidism was diagnosed if a patient was under l-thyroxine replacement therapy. Adherence to cysteamine treatment was determined by the physician according to the answer given to the following question: how do you assess your adherence to cysteamine: good, quite good, or period(s) without treatment. The clinical data on pediatric patients with cystinosis were recorded from a web-based national pediatric cystinosis registry system that was established in 2013 (http://sistinozisnet.org). One pediatric nephrology specialist from each center participating in the registry was responsible for entering his/her center’s patient data. The objectives of the national pediatric cystinosis registry system were as follows: (1) to identify the clinical characteristics of cystinosis at initial hospital admission and (2) to evaluate the long-term prognosis of cystinosis and the effects of the treatment with cysteamine. Demographic features, clinical and laboratory characteristics at the time of disease onset, results of genetic analysis, and treatment were initially entered into the registry for each patient. After this initial data upload to the registry, clinical and laboratory parameters were entered into the registry every 6 months. Physicians who were following up the patients in the registry were sent automated electronic notifications reminders to upload data every 6 months. All patients in the registry were evaluated by a joint committee that included physicians who specialize in cystinosis. Patients with features inconsistent with a diagnosis of cystinosis, patients with a heterozygous CTNS gene mutation, and non-Turkish patients were not included in this study’s final analysis. Genetic testing for CTNS mutations was not a prerequisite for patient registration; however, patients with cystinosis with any available genetic data were asked to join the registry. When calculating allele frequencies, only one patient from families with multiple affected individuals was taken into consideration. Leukocyte cystine levels on each visit were used to obtain mean leukocyte cystine level. The study protocol was approved by the Hacettepe University Ethics Committee (FON 12/27–35) and carried out in accordance with the Declaration of Helsinki. Written informed consent was obtained from the parents of all patients. In addition, all clinical and research activities described herein were consistent with the Principles of the Declaration of Istanbul as outlined in the Declaration of Istanbul on Organ Trafficking and Transplant Tourism. All genetic testing was performed at the Hacettepe University Nephrogenetics Laboratory. Briefly, DNA was extracted from peripheral blood following the standard phenol-chloroform protocol. All exons of the CTNS gene together with their adjacent intron junctions were analyzed via direct sequencing using BigDye v.3.1 chemistry and an ABI3130 genetic analyzer (Applied Biosystems, Foster City, CA). The National Center for Biotechnology Information transcript variant 1 of CTNS (NM_001031681.2), corresponding to ENSEMBL transcript ENST00000381870.7, was used as a reference sequence. Analysis of the CTNS gene was not performed in patients whose parents did not consent. Descriptive statistical analysis methods were used to evaluate demographic and clinical data. Mean, median, SD, and interquartile range (IQR) were calculated for numeric variables. Frequency tables were used to describe categorical data. The Mann–Whitney U test or independent samples t test was used to compare two independent samples. Survival analysis was performed using Kaplan–Meier analysis with overall log-rank testing. All data were analyzed using IBM SPSS Statistics for Windows v.21 (IBM Corp., Armonk, NY). The study included 136 pediatric patients (75 boys and 61 girls) from 25 centers who were registered in the national pediatric cystinosis registry (Figure 1). In all, 78% of the patients were born to consanguineous parents. Among the patients, 50 (37%) had a positive family history of cystinosis. The most common symptom at the time of diagnosis was growth retardation (85%; n=115). In total, 15 (11%) patients had genu varum and 15 (11%) patients had genu valgum at the time of diagnosis. Rickets was noted in 60 (44%) patients at the time of diagnosis. Among the patients, 135 had infantile nephropathic cystinosis, and one had ocular cystinosis. Genetic testing was performed in 98 (72%) patients from 85 families (170 alleles). Demographic data, clinical characteristics, and the most common mutations are shown in Table 1. 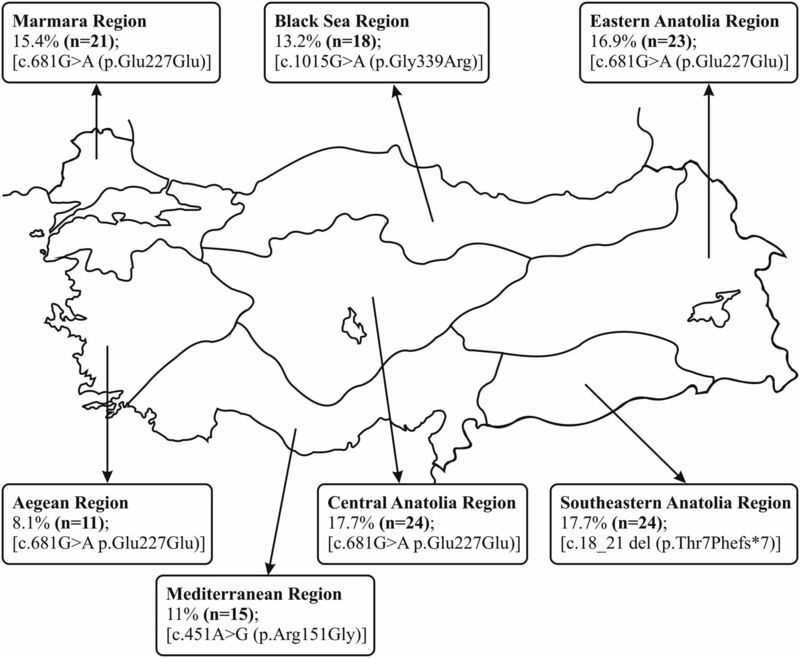 Geographic distribution of cystinosis patients in Turkey is representative for the country (most common alleles in each region are shown in parentheses). Among the 98 patients who underwent genetic testing, 88 were homozygous, and ten were compound heterozygous for CTNS mutations. To calculate allele frequencies, only one patient from each family was considered (even if a family had multiple affected individuals; i.e., 85 patients, 170 alleles). Novel mutations, known variants, and allele frequencies are shown in Table 2. The results of in silico analysis of novel mutations are shown in Supplemental Table 1. Mutations were categorized into three groups according to their predicted severity. Group 1 included missense mutations in which CTNS protein is present but has been predicted as a defective function. Group 2 included deletions, duplications, and splice site mutations. In addition, three missense mutations were categorized into group 2, because the mutations are either disrupting splicing motif (c.681G>A [p.Glu227Glu]) or resulting in formation of a truncated protein (c.664C>T [p.Gln222*] and c.G14A [p.Trp5*]). These mutations are predicted to cause a defective CTNS protein in structure. Group 3 included compound heterozygous mutations from group 1 or group 2 in each allele. Because of the very small number of patients with group 3 mutations (n=3), patients with group 3 mutations were not included in the final analysis. The numbers of boys and girls with missense mutations and deletions/duplications/splice mutations did not differ significantly. Similarly, age at the last follow-up visit and duration of follow-up did not differ significantly between the patients with missense mutations and deletions/duplications/splice mutations. After excluding patients who received RRT, patients with missense mutations had a better eGFR than those with deletions/duplications/splice mutations, but the difference was not significant (Table 3). The most common homozygous mutations (c.681G>A [p.Glu227Glu], c.1015G>A [p.Gly339Arg], and c.18_21 del [p.Thr7Phefs*7]) were also compared with the remainder of homozygous mutations. Patients with most common mutations were younger at the time of diagnosis and last follow-up visit than other mutation groups (Table 4). Hypothyroidism and rickets were observed in 33 (24%) and 39 (29%) patients, respectively. Gastrointestinal involvement was noted in six patients (hepatomegaly in five patients and gastroesophageal reflux in one patient). The distribution of systemic findings according to mutation groups is given in Tables 3 and 4⇑. Age of diagnosis, type of mutation, and the mean leukocyte cystine level did not affect the development of systemic complications. Adherence with cysteamine treatment was rated by the patients’ physicians. Adherence to oral cysteamine treatment was good/quite good in 115 (85%) patients, whereas adherence to cysteamine eye drops treatment was good in 116 patients. The mean leukocyte cystine level in the patients was 1.99 nmol half-cystine per mg protein (IQR, 0.6–3.8). Patients who were not undergoing RRT at the time of the last follow-up visit had a higher eGFR when the mean leukocyte cystine level was <2 nmol half-cystine per mg protein (P=0.02). At the time of the last follow-up, 21 (15%) patients were receiving indomethacine, 25 (18%) were receiving carnitine, and 20 (15%) were receiving angiotensin-converting enzyme inhibitors. At the time of the last follow-up visit, 49 (36%) patients were undergoing RRT, of which 12 were undergoing and 12 were undergoing hemodialysis. Kidney transplantation was performed in 25 patients during the follow-up period. Mean age of the patients with ESRD was 11±4 years old. Among the patients who underwent kidney transplantation, the mean eGFR was 100±32 ml⋅min–1⋅1.73 m–2 after a median follow-up of 5.1 years (IQR, 3.8–6). Before kidney transplantation, 12 patients were undergoing peritoneal dialysis, and eight were undergoing hemodialysis. In all, five patients underwent preemptive kidney transplantation. Genetic testing was performed in 19 (76%) patients who underwent kidney transplantation from 18 families; the most common mutation was c.681G>A (p.Glu227Glu), and it was present in 13 of 36 alleles (36%). Among these 19 patients, 18 carried a homozygous CTNS mutation, and one carried a combined heterozygous CTNS mutation (c.681G>A [p.Glu227Glu] plus c.1015G>A [p.Gly339Arg]). The remainder of the patients who were not undergoing RRT (n=87) had a median eGFR of 74±45 ml⋅min–1⋅1.73 m–2 after a mean follow-up period of 5.5±4.8 years. Patients in whom treatment of cystinosis began at age <2 years old had later onset of ESRD (P=0.02). Time to ESRD did not differ between the patients with missense and deletion/duplication/splice mutations (Figure 2). Time to ESRD (years) in patients. (A) Patients in whom cysteamine treatment was initiated at age <2 versus ≥2years old was different (P=0.02). (B) Patients with missense versus deletion/duplication/splice mutations was not different (P=0.79). (C) Patients with the most common homozygous mutations versus others was not different (P=0.54). This study was on the basis of data collected by one of the world’s largest pediatric cystinosis registries. We tried to identify the clinical and genetic characteristics of pediatric patients with cystinosis to improve our understanding of the diversity of this disease in the Turkish population. Because of the low incidence of cystinosis, the majority of previous series on cystinosis included both adult and pediatric patients. An important cystinosis study by Gahl et al. (6) that included 100 adult patients ages 18–45 years old reported that ≥50% of the patients had systemic complications. In their study, as in this study, the men-to-women patient ratio was 58:42. More recently, Brodin-Sartorius et al. (7) investigated the characteristics of 86 adult patients with cystinosis and reported a parental consanguinity rate lower than that noted in this study (12 of 86 versus 106 of 136), whereas mean age at diagnosis was the same in both studies (1.5 years). They also reported the earliest clinical symptoms of cystinosis to be polyuria-polydipsia (82%) followed by growth retardation (63%) and rickets (41%). In this study, the most common clinical findings were growth retardation, polyuria, and polydipsia. Similarly, rickets was observed in nearly one half of this study’s patients at diagnosis, and loss of appetite was also a common symptom at diagnosis in this study. Numerous genetic-based studies on cystinosis have been conducted with European and American patients with cystinosis, and they have identified many mutations. The most frequent (50%–70%) of these mutations is a large 57-kb deletion that removes the first ten exons and a substantial portion of the upstream sequence (8–14). It constitutes 75% of the mutated alleles in patients of Northern European descent with cystinosis (15); however, the spectrum of the mutations varies according to geography. Traveling from Northern Europe and America to the Southern Hemisphere, the frequency of the 57-kb deletion decreases. A study conducted in France performed genetic testing in patients with cystinosis, reporting that 66 of 68 patients were homozygous or heterozygous for a severe CTNS mutation and that 54% of the alleles carry the 57-kb CTNS deletion (7). Mason et al. (16) studied CTNS mutations in Italian patients with cystinosis and observed that the 57-kb deletion was present in only 17% of the patients. In this study, most of the patients carried a homozygous CTNS mutation, and the frequency of compound heterozygous mutations was low due to the high parental consanguinity rate. Most strikingly, none of this study’s patients with cystinosis had the 57-kb CTNS deletion. The difference between the genetic background of Turkish patients with cystinosis and European and North American patients was first reported by Topaloglu et al. (4). In their study, the genetic characteristics of 12 Turkish patients with cystinosis were investigated, and none carried the 57-kb deletion. This nationwide study includes a larger patient cohort, and as Topaloglu et al. (4) reported, none of this study’s patients had the 57-kb deletion. This study was on the basis of a national pediatric cystinosis registry and confirms that the most common allele in Turkey is c.681G>A (p.E227E; 31%). This mutation was first described by Aldahmesh et al. (17) in two families. The mutation involves the last base pair in exon 9, and the researchers hypothesized that it might affect the consensus sequence surrounding the conserved GT dinucleotide at the donor site. They also confirmed that the normal donor site was completely replaced by a cryptic donor site, resulting in inclusion of 98 nucleotides from intron 9 and a frameshift. Shahkarami et al. (18) studied patients with cystinosis in Iran, and they showed that none of their patients had the 57-kb deletion and that the most common mutation was c.681G>A (p.E227E; 40%). Soliman et al. (19) studied patients with cystinosis in Egypt and identified c.681G>A (p.E227E) in 7.7% of the patients. The high frequency of c.681G>A (p.E227E) in this region of the world is indicative of a possible founder mutation. The second most frequent mutation in this study was c.1015G>A (p.Gly339Arg; 22%). This missense mutation was first described by Shotelersuk et al. (8). In the study by Topaloglu et al. (4), it is detected in two of 24 alleles (8%) (4). Mason et al. (16) showed that c.1015G>A (p.Gly339Arg) is also frequently observed in Italian patients. Greco et al. (20) reported that this mutation is frequently observed in Northern and Southern Italy. Interestingly, this mutation is the most common cause of nephropathic cystinosis among Ontario Amish Mennonites. Another common mutation in this study was c.18_21 del (p.Thr7Phefs*7); this deletion was first described by Town et al. (11), and it causes a frameshift at exon 7 and forms a stop codon. In an earlier Turkish study, this deletion was detected in three of 24 alleles (13%) (4). The effect of type of CTNS mutation on clinical prognosis has been investigated (6,8). Gahl et al. (6) reported that homozygosity for the 57-kb deletion was associated with an increased risk of morbidity and mortality. To better understand the effects of the identified mutations on clinical phenotype, this study categorized them into three groups. The clinical characteristics of the two major groups (group 1: missense mutations; group 2: deletions, duplications, and missense mutations that cause a frameshift) were compared with each other. Although the duration of follow-up and mean cysteamine dose were similar in the patients with missense and deletion/duplication/splice mutations, the patients with missense mutations had a better eGFR at the time of the last follow-up visit, which might have been due to the less severe effect of missense mutations on clinical prognosis. This was not statistically significant (P=0.09), but in rare diseases, P value >0.05 might be acceptable when the difference is clinically significant (21). Relatively longer duration of follow-up time of both groups may help to make this difference more apparent. In addition, this study compared the most common homozygous mutations with the less common homozygous mutations. Patients with the most common homozygous mutations had an earlier age at diagnosis than those carrying the less common homozygous mutations. One of the most common mutations in this study was a missense mutation resulting in a frameshift (c.681 G>A [p.Glu227Glu]), and another was a deletion (c.18_21 del [p.Thr7Phefs*7]). These potentially severe mutations might account for the earlier age at the time of diagnosis. A critical issue in the treatment of cystinosis is the optimal time for initiating cysteamine treatment, which has the potential to improve kidney complications. It is known that, in untreated patients with cystinosis, the mean age at onset of ESRD is 10 years old, whereas in treated patients, kidney dysfunction occurs later (22); however, Cochat et al. (23) reported that the mean age at onset of ESRD was 10 years old, although 83% of the patients received treatment. The mean age at initiation of treatment in their study was 7 years old, which is relatively late, confirming that the timing of initiation of cysteamine treatment is critical. Many studies report that early initiation of cysteamine treatment and the dose are associated with better kidney outcome (5,7,20). Brodin-Sartorius et al. (7) reported that the mean age at onset of ESRD was 11 years old (median: 9.9 years old) and that patients who did not develop ESRD began cysteamine treatment at a mean age of 1.5 years old. The mean age at onset of ESRD in this study is similar to that in these studies, and time to ESRD was longer in this study’s patients, in whom cysteamine treatment was initiated at age <2 years old. 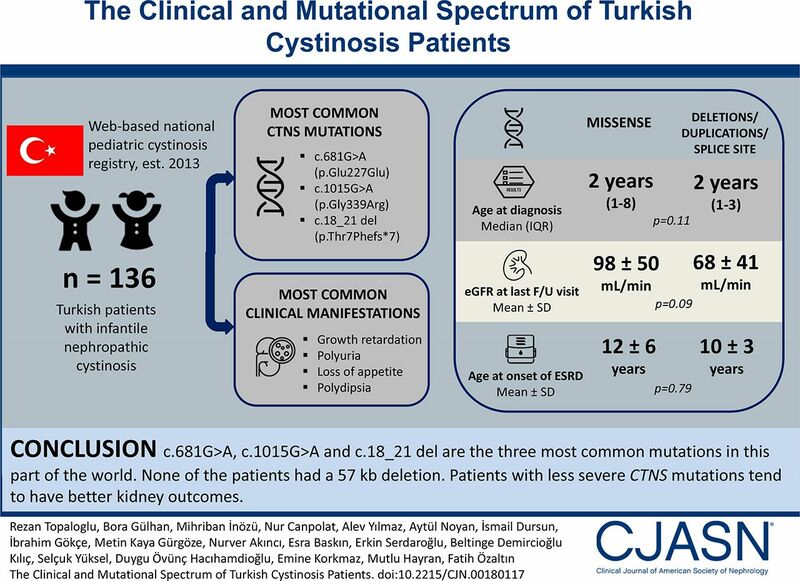 In conclusion, this study was on the basis of a unique Turkish pediatric cystinosis registry, and it identified seven novel CTNS mutations, which will contribute to improving our understanding of patients with cystinosis and different genetic backgrounds. The three most common mutations occurred in 67% of this study’s patients. Systematic collection of data on patients with cystinosis will help researchers improve characterization of the spectrum of cystinosis worldwide and facilitate comparison of patients in different geographic regions. This study was supported by Hacettepe University Scientific Research and Development Office grant 01301101001. The Hacettepe University Nephrogenetics Laboratory was established by Hacettepe University Infrastructure Project grant 06A101008. The Turkish Cystinosis Study Group also included Sare Gülfem Özlü (Dr. Sami Ulus Children's and Maternity Hospital), Fatma Şemsa Cayci (Ankara Child Health, Hematology, Oncology Education and Research Hospital), Yılmaz Tabel (University of İnonu, School of Medicine), Mesiha Ekim (Ankara University, School of Medicine), Elif Comak (Akdeniz University, School of Medicine), Osman Dönmez (Uludag University, School of Medicine), Sevcan Bakkaloglu (Gazi University, School of Medicine), Hülya Nalcacioglu (Kayseri Education and Research Hospital), Cengiz Zeybek (Gulhane Military Medical Academy), Alper Soylu (Dokuz Eylul University, School of Medicine), and Funda Baştug (Kayseri Education and Research Hospital). This article contains supplemental material online at http://cjasn.asnjournals.org/lookup/suppl/doi:10.2215/CJN.00180117/-/DCSupplemental.